Live another life, in another world—from battling ancient dragons, exploring rugged mountains, building a home, or mastering hundreds of weapons, spells and abilities. For the first time ever, go into battle Legend of Zelda style: fight with the Master Sword, guard with the Hylian Shield, while wearing the Champion's Tunic. 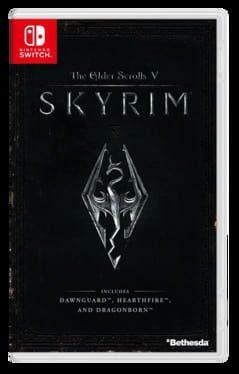 The game also includes official add-ons—Dawnguard, Hearthfire, and Dragonborn. We currently don't have any prices for The Elder Scrolls V: Skyrim Switch. Check back later.